We all have those in our lives whom we could never imagine getting married without. Your best friend from childhood, your favorite aunt, there are so many people who fall under the “I can’t say I do without you” category. So what about those that are part of your everyday life, that you can’t imagine living without? That’s right folks… I’m talking about your four-legged family members. More and more couples are opting to include their fur babies into their ceremony. Let’s hash out how to make this happen. Your pup or kitty deserves to feel pretty or handsome as they strut down the aisle on your big day. You can quadruple the number of oohhhh’s and awwwww’s as they make their wedding day debut but dressing them up for the occasion. Floral collars are super popular and fun way to dress up your pet for photo ops on your wedding day. Afraid that Sparky will tear his flowers to shreds? Why not opt for a bow tie? 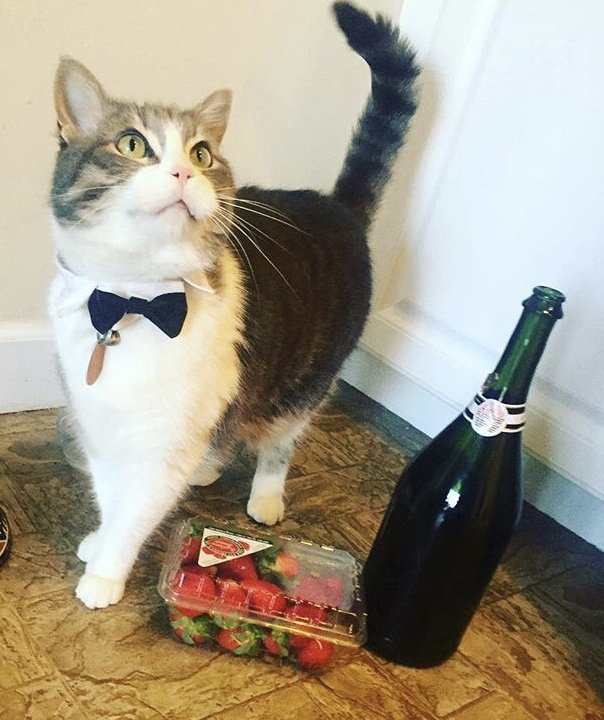 There is a certain Team Anyvent member who makes her cat wear a bow tie on a daily basis (I won’t name names), so why not pull out all of the pet-friendly formal wear you can find for the big day? I wasn’t kidding… some pets are always ready for a celebration! Trend Alert: Fur babies being part of the bridal party!!! They are a man’s best friend after all… We’ve had several of our couples this season include their pets as a bridal party member. What better way include something you love so much in the festivities. A lot of these pets were such an integral part of their love stories, engagements, and engagement photos that it only makes sense to have them front and center on the big day. Now for the logistics…. (Sorry, it’s the Planner in me!). Most venues will not allow pets inside. In fact, legally they cannot allow cats or dogs at catered events because of sanitation. Not to fear! There are a lot of folks who are catching onto this trend and will happily pet sit while you enjoy the rest of your wedding celebration. Don’t leave this up to chance by assigning a wedding guest to “pet drop off duty”. It seems simple enough, but as pet parents, you know that the simple can sometimes turn not so simple, especially if your pet is not used to your assigned person. Take my advice, and invest in a professional pet sitter, so that you and all of your guests can dance the night away!